The ECOSYS M3660idn, a black and white A4 (up to 8.5” x 14”) MFP, combines impressive performance, at speeds up to 62 ppm, with advanced features, all in a compact footprint. 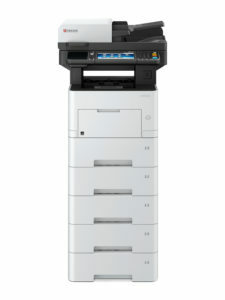 This Copy, Print, Scan and Fax solution is designed for ease-of-use with a 7” color touch screen tablet-like interface (TSI), and includes business driving features such as, exceptional print quality, up to Fine 1200 dpi, a 100 Sheet Dual Scan Document Processor, and a high paper capacity, up to 2,600 sheets. And, with the capability to run HyPAS Business Applications, solutions designed to fit your unique workflows and On-The-Go secure mobile Print/Scan needs, the ECOSYS M3660idn is a powerhouse ready to propel your business to the next level.